The Lambda on a Royal occasion. The date is the 26th August 1926, and Umberto, Prince of Piemonte, is driven by Vincenzo Lancia in a new Seventh Series through the main street of Varallo. This is the story of a remarkable Italian motor car. A car which came to be seen as a milestone in auto-mobile history, and one which foreshadowed many of the technical developments now taken for granted by today's motorists. Behind the machine, it is also the story of one man, Vincenzo Lancia, whose passion for the motor car brought him fame, first as a racing driver of great skill and courage, and then as the founder and principal of the company which still bears his name. In a short life - he died suddenly at fifty-five - Lancia achieved many things and made many significant contributions, but in the grand scheme of motoring history, the Lambda stands out as his masterpiece. 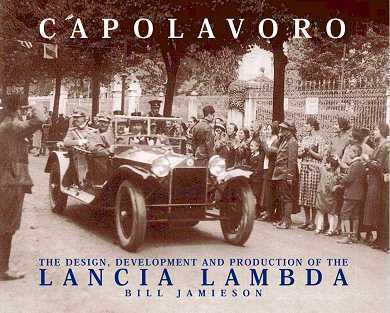 "Capolavoro" takes us on a journey from Lancia's early career and racing successes to the radical concept of the Lambda ; from the unconventional proto-type through the evolution of nine successive series of this famous model. We gain a close-up view of working conditions in the Factory, and share the triumphs and disappointments of the Lambda in competition. By today's mass production standards, a total output of just 13,000 units over some nine years is miniscule, but such was the significance of the Lambda that this was more than enough to ensure a permanent place in history for the car and its creator. This masterpiece was presented on the Raduno Lambda, celebrating the 80th anniversary of the Lambda, in Fobello (Italy) end of August 2001. Bill spent more than 25 years on research and interviews (a.o. with Battista Falchetto, one of the Lancia pioneers) to create this most comprehensive book on the Lambda and the man behind it. The (English) text is easy to read. The book includes an abundance of pictures and drawings, many published for the first time. Capolavoro is printed in Belgium. The price is a modest € 130. Postage inside Europe is € 10. Outside Europe postage is € 14. Contact Jan Van Hoorick at jan@vanhoorick.com for details. We are sorting out the internet payment methods and will offer one within a few days.